After flying for 48 years - in other people's airplanes - I decided to take the plunge and get my own.The following are some pictures in a show and tell. The instigator was my bad hip, immobility for two+ years, and my miraculous return to pain-free movement. I always lived for today, but this was a big wake-up call. After my hip replacement - I got back to "normal", and decided I had better get my act together, while there was still time. In the Fall of 2011, after my recuperation, we drove around a bit and realized what we had been missing during my hip problem. So we considered our options. An RV (not the airplane kind)? Nope - we had been down that road before and are glad to say we done that - RV'ing is not for us. We looked at a boat - a bigger one - I had sold my trusty Boston Whaler after 20+ years, just before my operation. Very appealing - I like boating - but, although this is great boating country, the destinations are somewhat limited by range, speed, and geography, You can't go to Moses Lake in a boat - or even down the Oregon coast. And, we couldn't find a nearby moorage - if I had, this story might have taken a very different direction. Some Flight Times (at 104 kts) - Bremerton - Seaside, Oregon 57 minutes; Wenatchee 60 minutes; Friday Harbor 36 minutes. In typical engineering fashion, I began a search and definition exercise - DR&O in Boeing talk - Design Requirements and Objectives. I quickly ran my list from 100 to 12 to about 5 airplane types. 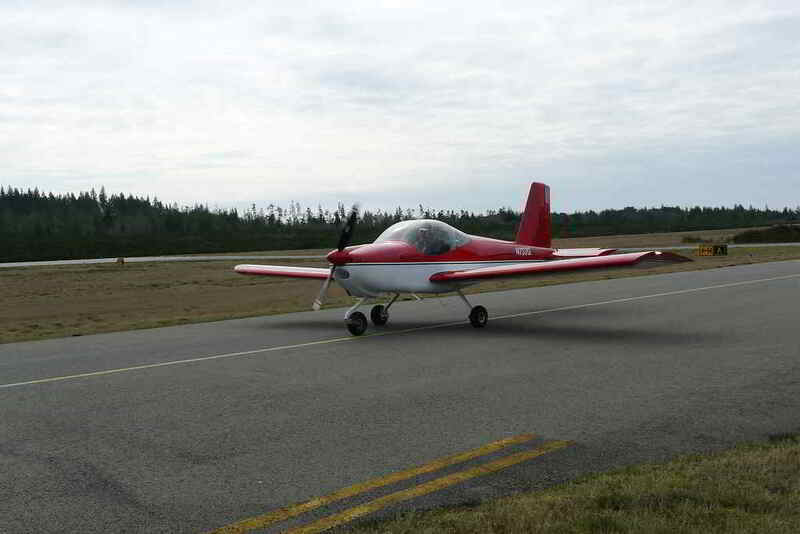 A finalist emerged - a Vans RV-12 - an all aluminum Light Sport, kit-built airplane. 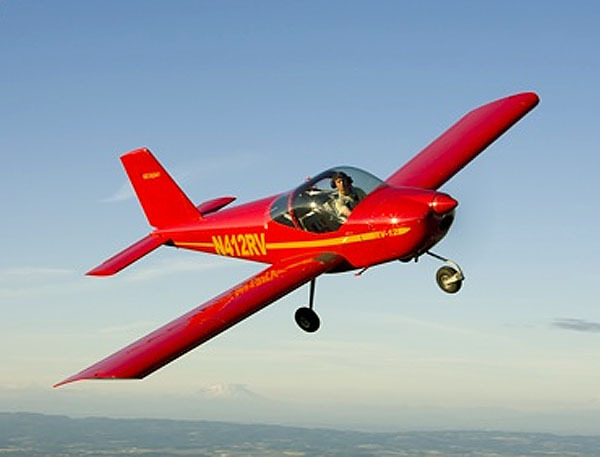 From Vans - the leading kit plane manufacturer, close-by in Oregon. 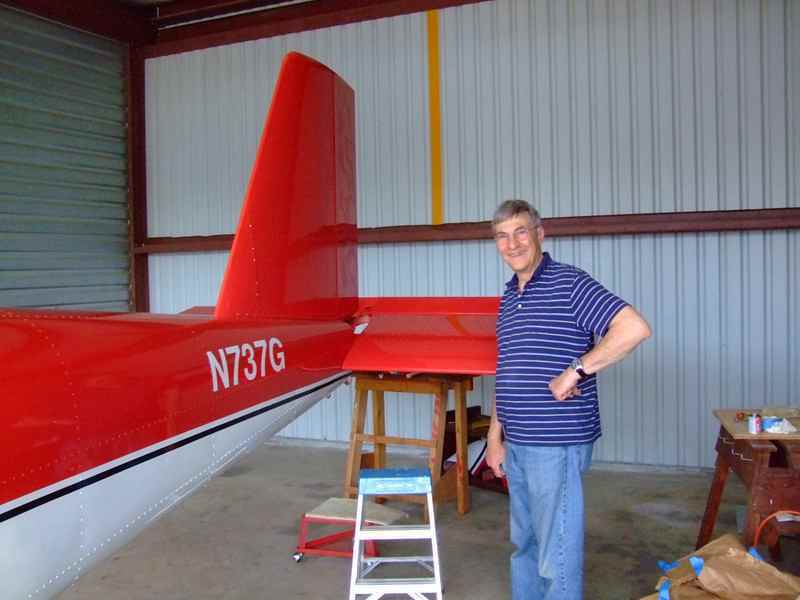 With multiple active museum airplane projects going - I had no desire (nor the time) to build an airplane. They take 2-5+ years. I wanted to fly. Now! In December 2011, we drove down to the Van's factory south of Portland, Oregon, and took a ride in the factory demonstrator. That hooked me - nice looking, relatively speedy, and easy handling. Fantastic visibility. Dot & me after my ride in the Demo airplane. This was a "joint" decision, and I didn't do any "selling" or arm-twisting. In part, you could say I did this in self-defense, to prevent any future outbursts about "my" airplane. In fact, I left the final decision entirely up to her. I knew I had succeeded in this scheme when I overheard her talking to her girlfriends on the phone about "our airplane." So! - Now, I could look seriously for an airplane. The hangar was my Field of Dreams solution - "If I get it, it will come...."
Stocking it with tools, benches, equipment etc - an empty place awaiting an occupant. I knew one thing - I DIDN'T want to BUILD an airplane. I've watched others toil for years - indeed decades - working on their projects. I didn't have anywhere near the time or energy to undertake that. Besides, I'd been building airplanes my whole life. I didn't need to build another one. I wanted to FLY, not Build. 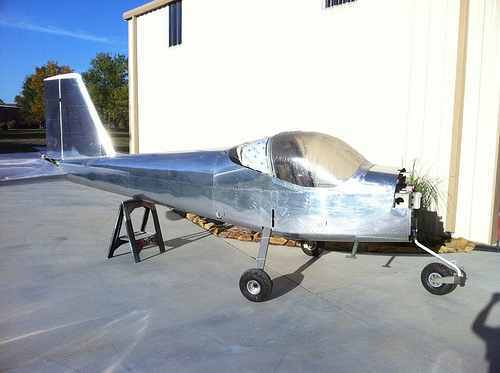 So, I looked at a few completed airplanes, and, to make a long story short, bought a partially built airplane. It was down in Tulsa, Oklahoma, I was going to finish it and install the systems and avionics (instrument and radio systems), which I figured wouldn't take too long - wrong! Kinda bought a Pig-in-a-Poke, without inspection - not usually my style - but the builder had built many RV's and I trusted his reputation. Maybe my instincts were ultimately proven in error, but - onward and upward. The airplane arrived up here on March 17, 2012 by truck from Oklahoma City, where I had had it painted. I had to give a Connie talk at the Museum that morning and then zipped over to Bremerton Airport, where the hangar was rented and waiting for it. It was a long and exciting day! Well, I bit off a BIG one this time - again........ Seems I never learn. A lot more sheet metal work than I anticipated, and of course - a lot of wiring. Systems work. Fuel. Brakes. A huge man-hour sponge - I was afraid of this. Was hoping to fly by the end of April. Then - by the end of August? December? Spring of 2013 looked like it - a year instead of a month. With my new Toy - a very long road ahead. Wound up re-doing a lot of the previous builder's work. And the exotic electronics took months to sort out and get working. Started in the cold and wet, ran through the hot summer, and back into the cold and wet, .... or just the cold. But -- perseverance pays off - I hoped. It was my main weapon. Keep plugging away. It was also dark - when it rained - it often blew in the hangar doors, so I had to keep them closed, making the hangar VERY dark - and working completely with portable lights - not fun! And Dot helped too - when more than two hands were needed. She bought into this idea from the beginning (or it wouldn't have happened.) As noted above, she even refers to it as "our airplane." 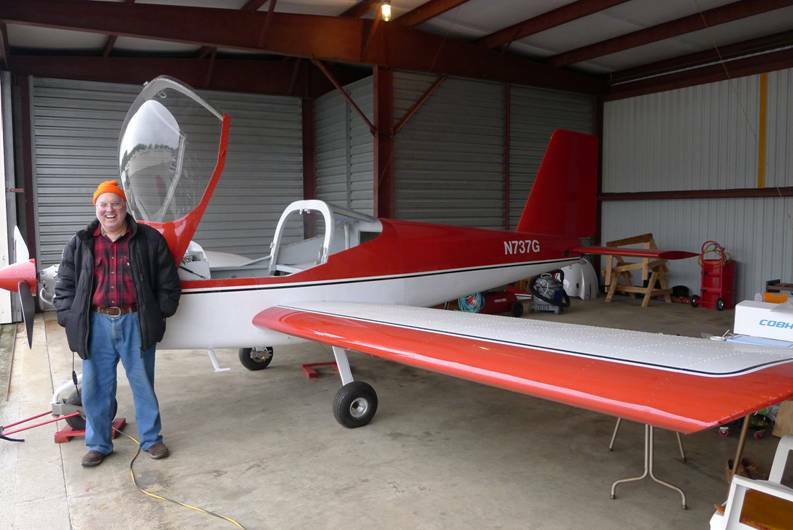 In the process, I acquired a very good friend and mentor - Tony T. - who had built one - an RV-12, that is. He has helped with tools and expertise at every step along the way - he even helped me find a hangar, which started this long trail! Actually, this project wouldn't have happened without Tony - plain and simple. He even provided spiritual guidance and encouragement when I got discouraged and was having some bad days. The man is a Saint. These, I could fabricate at home in my shop. 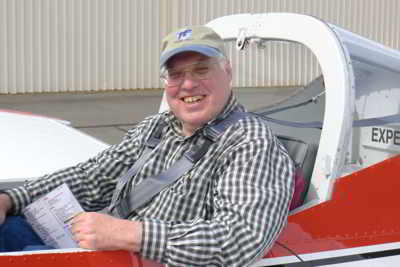 Along the way, I had to get re-qualified and get my Pilot's License up-to-date. 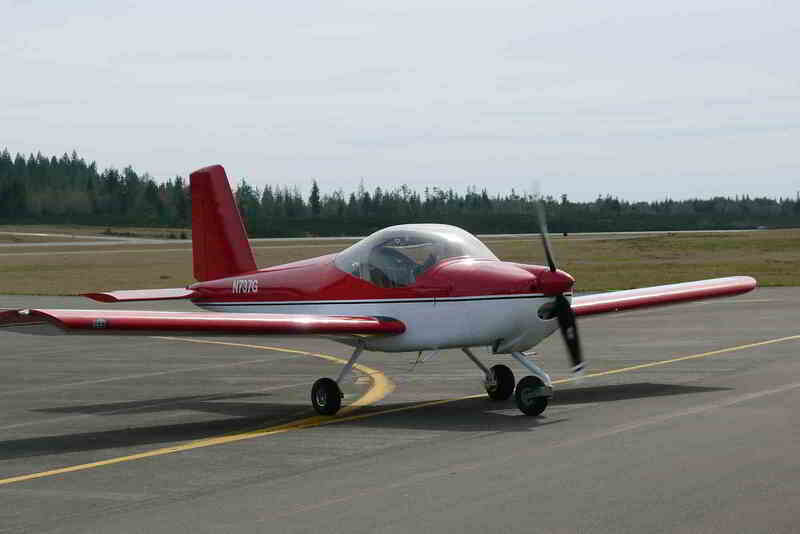 That was in a Piper Cherokee at Bremerton. 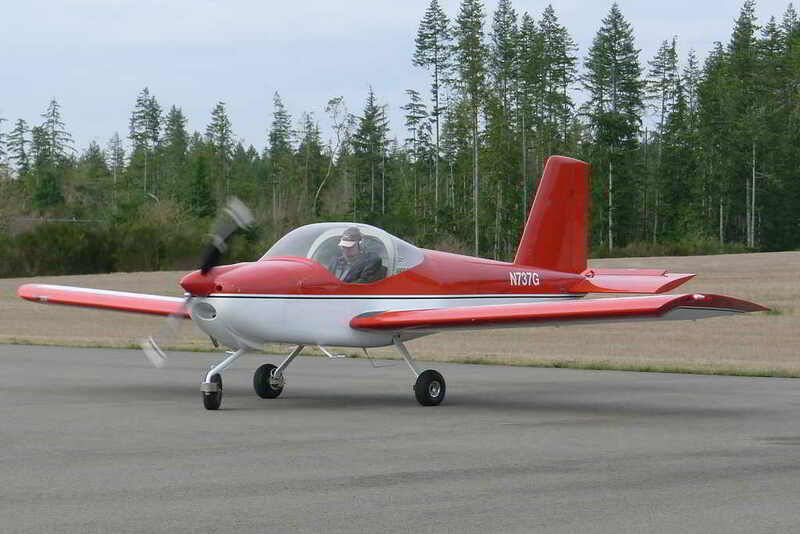 Then I got checked out in the RV-12 itself, down in Oregon. 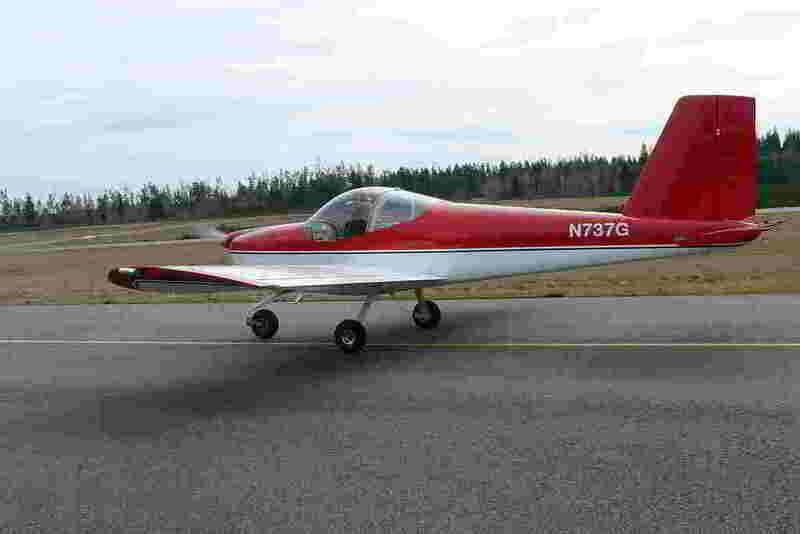 It was the same factory demonstrator airplane I flew initially. Here I am with my instructor Mike Seager - 43 landings in 8 flights in 3 days. A pretty grueling session! I also went to school on the Glass Panel and Avionics at the factory. And to Repairman's school to get my FAA License that will allow me to do the maintenance and Annual Inspections on the airplane. Every wire in this very sophisticated and computerized airplane had to be traced and installed and checked out. It was supposed to be "Plug n'Play" - but it wasn't for me - it was mostly "Plug and Pray." Some of those wires had a hard time finding a home! My friend Jay in Minnesota said the rat's nest of wires was a disaster and nothing that he would have done. Well, eventually, it got sorted out, made neat, and all operational. I've learned the Hard Way, that making them Neat First, is a sure-fire recipe for ripping them all apart again when they don't work. Better to have everything working correctly in sort of a giant mock-up. Then you can make them pretty. A couple of months lying on my back with my head under the panel - now that is No Fun! And then - it was time for that exciting day for any airplane - Electrical Power On! The Smoke Test. Even that didn't work out - not initially - in fact - NOTHING happened when I turned on the Master Switch - but eventually I DID get the Power On and didn't "smoke" anything. At least THAT time. I did generate some smoke a few weeks later, but that set-back was overcome too. But - the main thing - it worked!!!!! October 1, 2012 - Wow! The panel is pretty amazing - INCREDIBLE is more appropriate - just one instrument - a 10 inch video screen. No Steam Gages. Everything is in it - Flight Instruments. Engine Instruments. Navigation Instruments. Autopilot. Transponder. It does everything but make your breakfast. At first the various boxes on this computerized airplane wouldn't talk to each other, but slowly, wire-by-wire, I got them to handshake and communicate. Eventually, everything talked and worked, (almost everything - still a few non-critical loose ends....) - and - then I could make all the wiring neat and clean.There are three main screens on the panel, and they can be moved around and customized in every imaginable way. 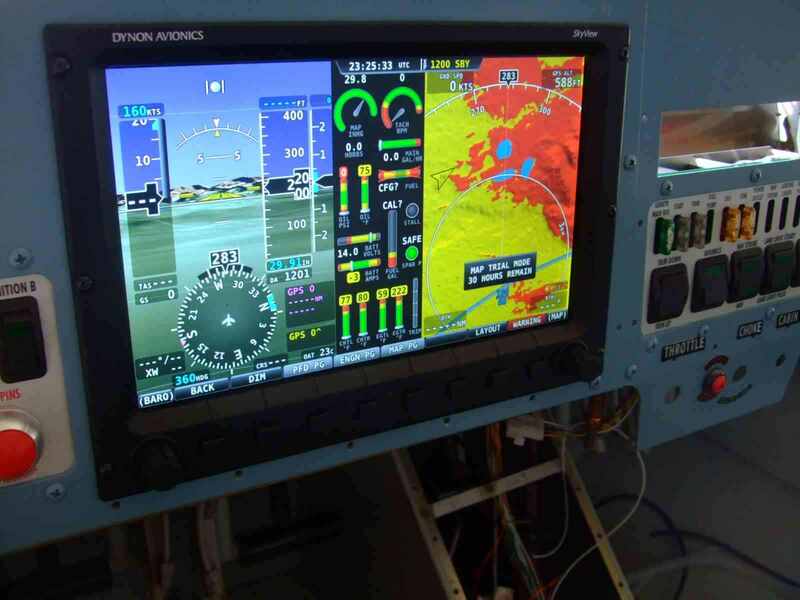 The PFD - or Primary Flight Display - provides attitude and heading data, as well as the Air Data functions (Airspeed, Altitude, Vertical Speed.) But that's just the beginning - it also has Synthetic Vision - as seen here, Terrain Awareness, Flight Path Projection, and Traffic and Collision Warning. It even shows all the details of the runway, right down to the numbers and paint stripes, without ever looking outside. Also a full two-axis Autopilot that can fly courses, capture altitudes, and much more (L-NAV and V-NAV for my airplane pals)......more than is on a Boeing 787 - no kidding. The GPS derived Map Display shows Terrain (as selected here - with Red being above you, Yellow within defined altitude below you), roads, railroads, airspace restrictions, airfields, nav facilities, Weather, TFRs, Traffic,Course lines, Flight Plan route info and much, much more. The Engine Display shows all the information about the Engine and Fuel system, and other airplane systems. The manufacturer is Dynon - located locally in Woodinville - very helpful people and convenient. 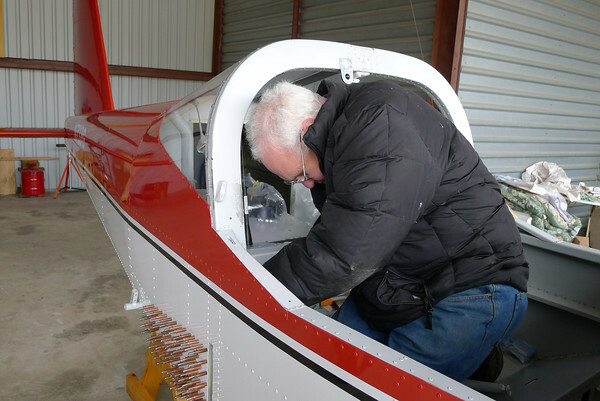 Friday, November 16 was a BIG day - Tony helped me install the fuel tank, tension and rig the flight controls, and then -- install the wings for the first time. N737G now looked like a REAL airplane! Now I could take her outside during a break in the rain and get a picture of her - mostly put together. It was dramatic! What a Beauty! With the fuel tank installed, I could add fuel and calibrate the Quantity system (FQIS.) 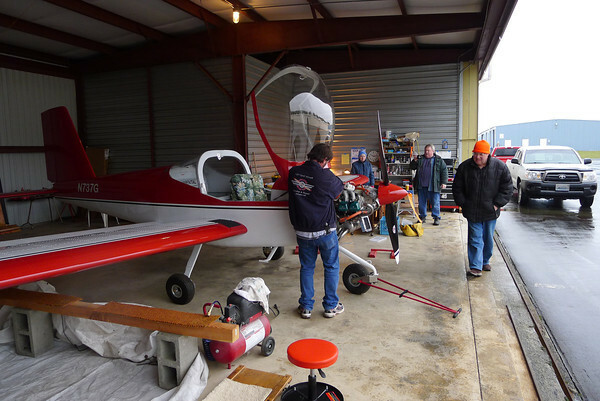 This got me ready for the next step..
Thursday, Dec 6 was a big milestone - a team of two Rotax engine mechanics came and started the engine for the first time and performed a series of tune-up operations, including balancing the two carburetors. The engine started instantly and ran well, including high power runs. January 23, 2013 was yet another BIG DAY. Was out at the hangar at 5 AM in the cold, wet, dark. 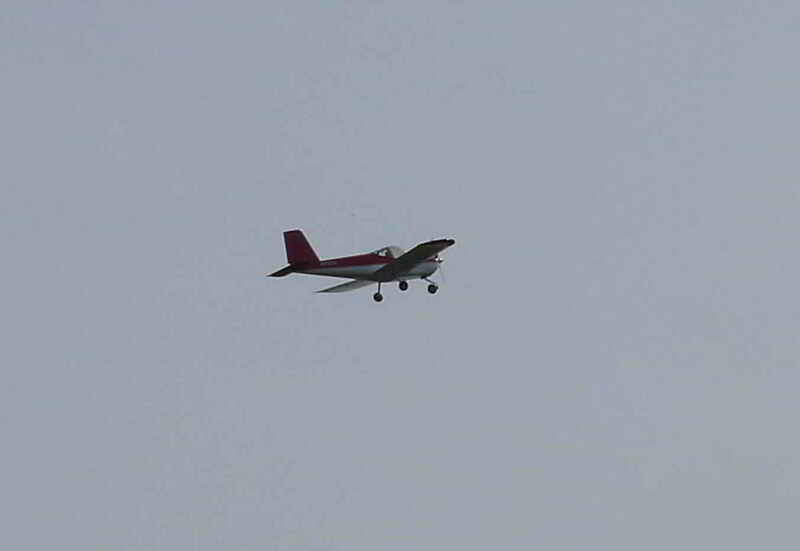 Two Inspectors came from the FAA to inspect the completed airplane and determine its airworthiness. 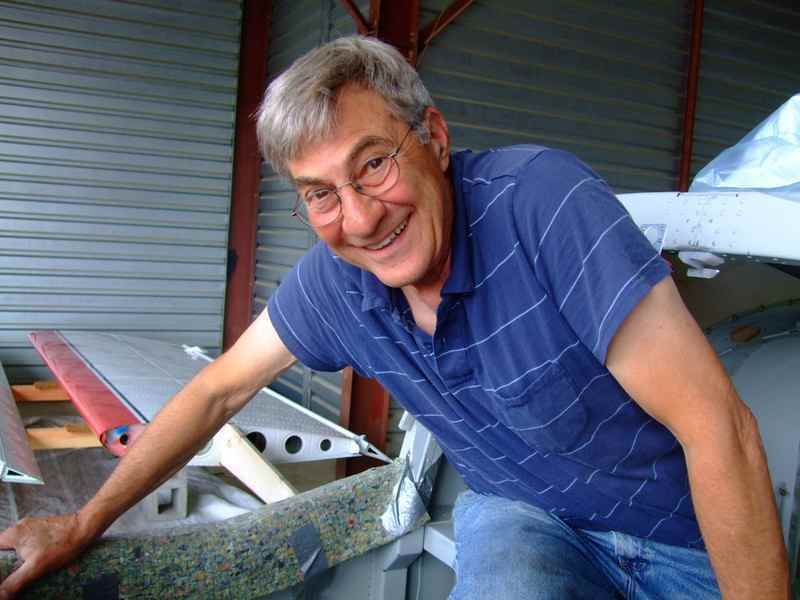 Normally, this task is accomplished by a non-FAA individual designated by the FAA - a DAR - or Designated Airworthiness Representative. But the only local DAR was out-of-country for an extended period, so the FAA elected to perform the inspection themselves. 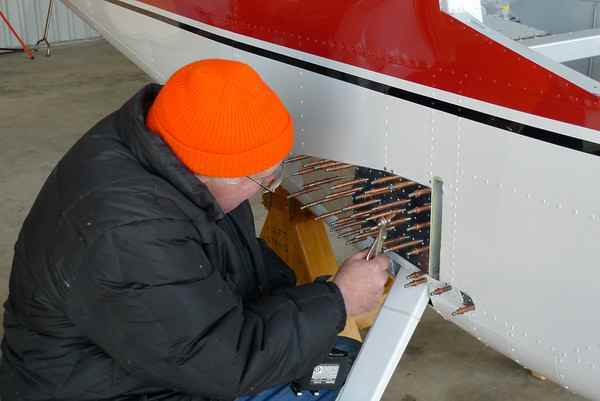 DAR's usually take about an hour to do the inspection; the two FAA inspectors spent about 6 hours - or 12 man-hours. My friend Tony and I were very apprehensive to start with, and grew more so as the hours passed - we figured we were about to bust the inspection. 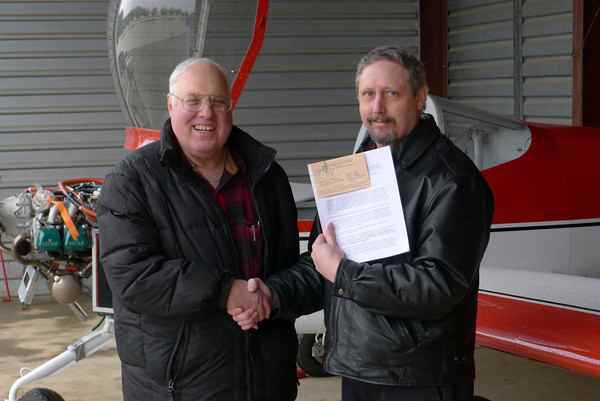 But - in the end - we cleared all the hurdles and I was granted my C of A - Certificate of Airworthiness! I've worked on airplanes my whole life, but now I had actually BUILT an airplane! At this point, I was legal to fly the airplane at any time. However, much work still remained. I had to finish closing up the airplane - there were all the areas that had been opened up for the FAA. And, I decided to incorporate a major manufacturer's Service Bulletin affecting the Landing Gear before I flew the airplane. The SB was not mandatory, and was recommended for accomplishment within one year - but I figured I might as well do it first. Doublers, Triplers, and Landing Gear attach hardware. That, and the final chores actually consumed another two months, making my last and ultimate Milestone - First Flight - get pushed back yet again - more than a full year, on the road to actually building - and completing - this airplane. Did five different taxi sessions over the next week, getting used to handling the airplane on the ground - including two medium speed runs down the main runway. It's what it's all about with an airplane. Taxi-in after the successful First Flight of N737G. The famous "RV Grin"! ©2013-2014 Robert Bogash. All Rights Reserved.